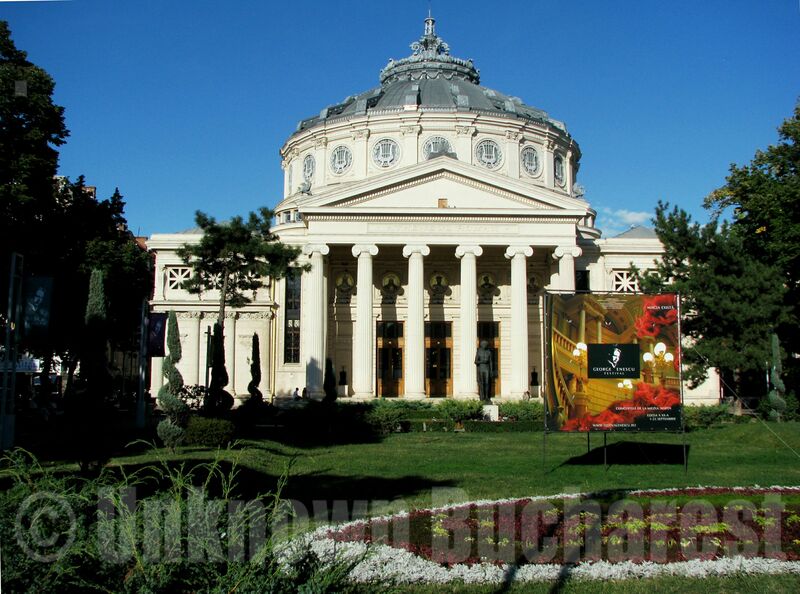 A visit to the Athenaeum is a must of any Bucharest city tour. Please consider my suggested tour Full Day Bucharest Tour, or browse through my Bucharest City Tours to choose the one that suits you best! On one of the oldest and most representative artery which is Calea Victoriei, across the former Royal Palace, stands the Athenaeum, the celebrated symbol of the national culture, a prominent architectural and cultural heritage. As an institution dedicated to the “endowment of people with useful knowledge”, the Athenaeum Cultural Society had been founded as far back as 1865, but the construction of a suitable building started only three decades later, i.e. in 1886. The architect was the French Albert Galleron, who is also responsible for the construction of the National Bank Palace. Meant to be “a temple of Romanian arts, sciences and culture”, the Athenaeum fully accomplished its mission. In this place were given lectures by great Romanian personalities and scholars, and were organized the official painting exhibitions. Under the dome of the Athenaeum were held the concerts of the Romanian Philharmonic Society and have been launched, in first audition, Romanian classical music masterpieces. The then very young Romanian composer George Enescu (1881-1955) conducted on March 1st, 1898 on the scene of the Athenaeum the premiere of his enthusiastically acclaimed “Romanian Poem” and in 1914, Beethoven’s Ninth Symphony was played for the first time in the Romanian Principalities. Presently, the Athenaeum is home to the country’s most prestigious George Enescu Philharmonic Orchestra, named after the great Romanian composer, and hosts the “George Enescu” Classical Music Festival, the biggest cultural event in Romania and one of the most important in Europe. The 800 seats ensure perfect visibility of the stage from every point and impeccable acoustics. As a matter of fact, its exceptional acoustics place the Romanian Athenaeum Hall among the most successful constructions of its kind worldwide. The Athenaeum is more than the cultural symbol of the nation. In 2007 the Romanian Athenaeum received the European Heritage Label, which is granted to sites that have a strong symbolic value for European history and heritage.